okay, i guess i don't know my own strength. apparently i gave her a black eye! 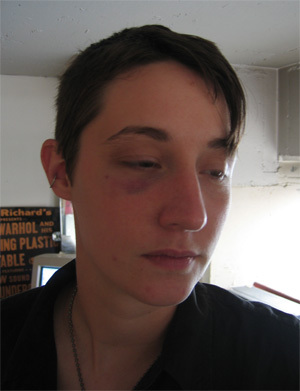 also i hear the bruising has gotten even darker since this picture was taken. let this be a warning to all would-be muggers, rapists, etc. : don't mess with me. that's awesome! funny how she has the sad, beaten-down look on her face like she's just been assaulted and the cops are taking pictures to document her injuries. SHE LOOKS LIKE A DYKE. ARE YOU BACK TO BEING GAY? that's not a nice word to use unless you are one. i am now, and have always been, bisexual. What's wrong with Gay? GAY PRIDE, MUCH?? My black eyes are, lyk, so much worse.